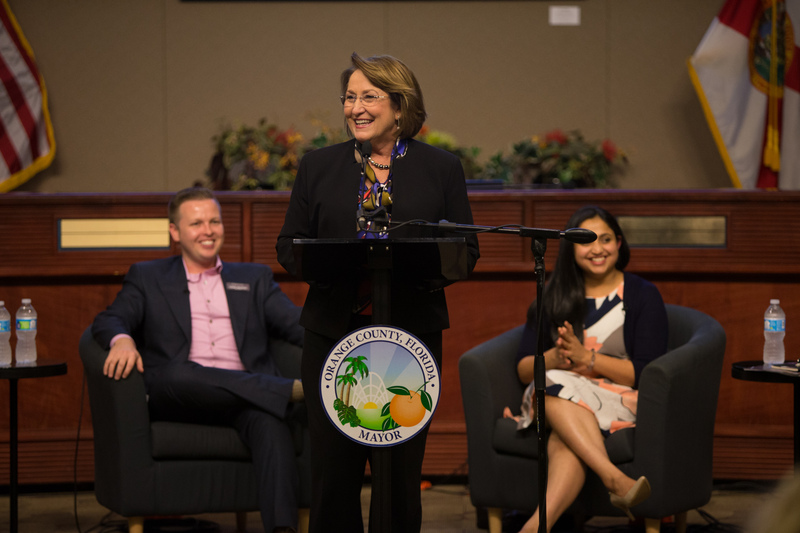 Orange County Mayor Teresa Jacobs invited local millennial community leaders and business professionals to explore affordable housing solutions in Central Florida on Oct. 12 at the Orange County Administration Center. The workshop titled “The Millennial Lifestyle” included interactive stations for attendees to engage and learn more about Orange County’s new code process, Orange Code, regional living options and to gather feedback on sustainability improvements for the community. The program was moderated by one of the Mayor’s millennial staff members, Danny Rivera. The panelists of experts in sustainability, real estate and transportation sectors included Director of Sustainability at the City Orlando, Chris Castro; Realtor and Property Manager of Orlando Resorts Rental, Daniel Waldron; and Transportation Planner at MetroPlan Orlando, Nikhila Rose. Panelists also touched on the fact that Orlando is a more affordable city to live in than other urban cities, but it is harder to find affordable homes because of lower household incomes. Additionally, many millennials only have one income because of delaying marriage and are also saddled with student loan debt. Transportation was also an important issue addressed. Nikhila Rose from MetroPlan stated that there is a perception that people do not want to leave the “comfort of their cars,” but MetroPlan studies show that 93 percent of residents want more transportation options. However, local challenges include a lot of dense areas encouraging urban sprawl. Sustainability is also of paramount importance to millennials. In October 2016, Mayor Jacobs hosted the inaugural Regional Affordable Housing Summit. Planners, developers and local government leaders from across the region gathered to explore affordable housing solutions for Central Florida, including strategies, tools and best practices that have been implemented throughout Florida and across the country. The goal of the summit was to utilize the community’s collective experience and knowledge to create a regional approach to address affordable housing needs. As a result of the Summit, a series of workshops were developed to get the public involved in the decision-making process and to focus on locating areas, both regulatory and monetary, to meet the growing housing need in the region. The Millennial Lifestyle Workshop was a byproduct of the series of Affordable Housing Workshops. This program was aimed at targeting the specific generational group born between the early 1980s to the early 2000s. Millennials are the largest living generation by population size and are increasingly entering the workforce, purchasing homes and giving back to their communities. In order to better create a community suitable for population growth in a way that enhances the quality of life for current and future generations, Orange County focused on gathering feedback from these local influential millennials to better plan for the future. Photo Caption: Mayor Teresa Jacobs addresses attendees at Orange County’s Affordable Housing Workshop titled, “The Millennial Lifestyle” on Oct. 12.